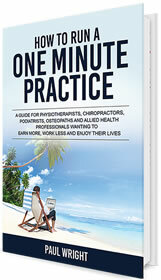 To add the “How to Run a One Minute Practice” book for ONLY $9.95 AUD click on the Book button to the right. I just want the book ONLY and do not need to know how to correctly employ contractors and employees in my health business. Note - This special offer is ONLY available on this page and cannot be accessed once you navigate away. The Contractor V’s Employee DVD/CD program is currently available on our website for $125 PLUS P and H – however - with the “Special Book and Contractor DVD/CD Bundle Offer – you get the BOOK PLUS the Contractor DVD/CD for ONLY AUS $59.90 including all P & H for BOTH incredible resources. 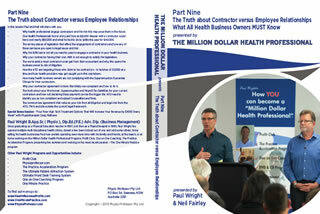 In this powerful and ESSENTIAL program Paul and Neil reveal the true nature of Contractor versus Employee as it relates to health business owners and how getting this wrong can lead you to a long and drawn out legal issue - and potentially close your business. Why health business owners engage contractors and how this potentially opens the owner to the risk of legal proceedings. How to understand the legal complexities when classifying a team member as a contractor or an employee. How anyone who contracts out their personal services (labour or intellectual input) for either an hourly, daily, contract rate or commission only is automatically caught under the Personal Services Income (PSI) Legislation and what this means to you as a health business owner. How many individuals self-assess as contractors without understanding how the rules should be interpreted – leaving you open to litigation and future legal issues. Why many contractor agreements drawn up by capable, well-meaning professionals, including lawyers and accountants, will fail when tested. Why recent ATO and Fair Work Australia prosecutions have rebutted the vast majority of individual self-assessments, written contractor agreements and labour hire agreements in common use today. How less than 4% of all contractor engagement documents we audit are near compliant. How to protect yourself from costly legal expenses and still run a successful health business using contracted team members. 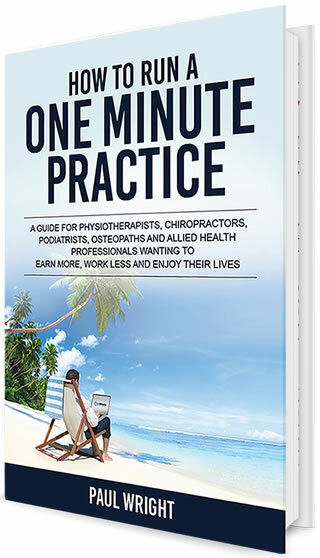 To order the “How to Run a One Minute Practice” physical book PLUS the “Contractor V’s Employee” DVD/CD for ONLY $59.90 AUD click on the Bundle button to the right. YES - I want the book AND the Contractor V’s Employee DVD/CD program so can understand how to correctly and legally engage current and future team members in my business.